Often referred to as the “Land of Fire and Ice”, Iceland’s landscape is characterized by waterfalls, geysers, glaciers, volcanoes, beaches, thermal hot springs, and otherworldly steaming lava fields. In addition to stunning landscapes, Iceland is a birder’s paradise. Its remote location at the junction of two oceans allows for a unique mix of migratory and vagrant species. Join Audubon Society of Greater Denver and Reefs to Rockies on this unforgettable birding and natural history tour to Iceland. DAY 1 (Fri, May 31): Arrival/ Reykjavik ~ Upon arrival to Keflavik Airport, you’ll be met and transferred to Reykjavik for a guided city tour. This afternoon, soak in the Blue Lagoon’s therapeutic waters. NOTE: Icelandair non-stop flight to Reykjavik from Denver departs on Thurs, May 30 at 7:50 pm and arrives to KEF at 9:15 am on May 31. DAY 2 (Sat, June 1): Reykjavík – Borgarfjörður – Stykkishólmur – Flókalundur ~ Today, drive along the scenic coastline of Hvalfjordur Fjord (Whale Fjord), one of the longest and deepest fjords in Iceland. In West Iceland, explore Hraunfossar (Lava Falls) and Barnafoss (Children’s Falls) known for their exceptional beauty and unusual natural phenomena. Stop at Deildartunguhver hot spring, which bubbles out of algae-covered boulders at a steamy 97°C (200°F). In the afternoon, reach Stykkisholmur Village and take a lovely ferry ride across the spectacular seascape of Breidafjordur Bay dotted with 3,000 tiny islands. Encircled by mountains and the Snaefellsjokull Volcano, the dramatic bay is home to 50 bird species, including the rare white-tailed eagle and gray seals that enjoy lounging about on the small islets. DAY 3 (Sun, June 2): Rauðisandur – Breiðavík/Patreksfjörður ~ Discover unique sights in one of the least visited places in Iceland. In the quaint fjord village of Patreksfjordur, stop for traditional Icelandic crepes with fresh cream and jam. The highlight of the day is a stroll along Raudisandur Beach, a 10 km (6.5 mi) cinnamon-colored sculpture of sand and shell that is unlike anything else in Iceland. The mesmerizingly beautiful beach shifts in color from golden to orange and red depending on the light of day. In a setting of black cliffs, Raudisandur shelters a large lagoon where curious seals and Arctic skuas are regular visitors. Afterwards, peruse unusual treasures at the quirky folk museum in Hnjotur. DAY 4 (Mon, June 3): Látrabjarg ~ With an early start, hike along seaside cliffs to reach Latrabjarg, Europe’s largest bird cliff and the #1 ‘Greatest Wildlife Spectacle’ in the world according to Lonely Planet. 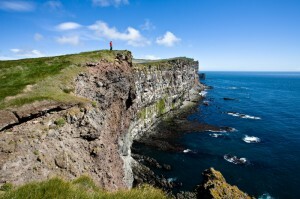 Stretching 14 km (8.75 mi) and peaking at a height of 441 m (1,447 ft), Latrabjarg Cliffs are located as far west as it is possible to stand in Europe. On high, jagged formations, shaped by volcanic action and pounded by icy surf, the stunning cliffs host mindboggling colonies of sea birds (auks, common and thick-billed murres, razorbills, and Atlantic puffins). 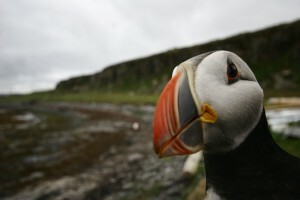 Safe from Arctic foxes, the birds are fearless, providing plenty of photo opportunities at close range, including Iceland’s famous, playful puffins. DAY 5 (Tues, June 4): Bíldudalur – Ísafjörður ~ Traveling along the winding coastline of magnificent fjords, head towards the colorful fishing village of Isafjordur. As the honorary capital of the Westfjords, Isafjordur boasts a lovely old town center with beautifully restored timber buildings, a thriving harbor, and stylish cafes. En route, stop at spectacular Dynjandi Waterfall (The Thunderer), a collection of seven cascades resembling a tiered wedding cake. Later, have the opportunity to take a dip in an outdoor thermal hot spring with gorgeous vistas. DAY 6 (Wed, June 5): Ísafjörður – Hólmavík – Gauksmýri ~ From Isafjordur town, the route provides coastal views of the scenic fjords en route to Holmavik Village where you’ll stop to enjoy freshly baked waffles, a local favorite, in a small café. In the 1600s, this area was renowned for wizards and witch hunts. Visit a gleefully morbid exhibit at the peculiar Museum of Sorcery and Witchcraft. Drive through fertile green valleys to Laugar in Saelingsdal, an area rich in ancient Saga folklore and history. DAY 7 (Thurs, June 6): Gauksmýri – Húsavík ~ Travel through Skagafjörður, an area famous for horse breeding. Continue to Húsavík village driving through Akureyri also known as the trade and cultural capital of the north. 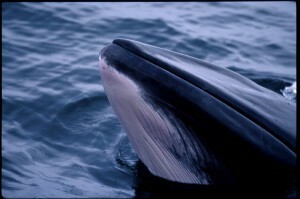 In the early afternoon, experience a unique sailing tour combining whale watching and bird. On board, experience the aura of past times by setting sails or assisting the skipper. The Schooners take you to Lundey, the Puffin Island, as well as the traditional whale watching areas. This is your chance to get up close to the magnificent creatures that inhabit the seas in Eyjafjörður, as your expert guide gives you a fascinating insight into the life of the ocean. The bay is full of surprises and the most commonly sighted whales include white-beaked dolphins, harbour porpoises, minke and humpbacked whales. DAY 8 (Fri, June 7): Húsavík – Mývatn ~ After breakfast, head to the Lake Mývatn area stopping by the Godafoss Falls or “waterfall of the Gods”. Arrive in Myvatn for a bathe in the surreal surroundings of the Mývatn Nature Baths. Afternoon focus on birding. DAY 9 (Sat, June 8): Mývatn ~ Full day exploring the area for birding with stops at Skútustaðir pseudo-craters, the Bird Museum, Grjótgjá Cave, and Krafla volcanic area along the way. DAY 10 (Sun, June 9): Mývatn – Akureyri – Flight to Reykjavik – Departure ~ Transfer to Akureyri for 45-minute flight to Reykjavik and then to Keflavik in time for flight home. NOTE: Icelandair non-stop flight to Denver from Reykjavik departs at 4:45 pm and arrives to DEN at 6:40 pm same day. Package includes accommodations, airport transfers, meals as listed (coffee, tea, and water with dinners), 10 guided days from/to Reykjavik, private coach with professional driver/guide (Snorri Ingason), ASGD Trip Host, ferry from Stykkisholmur to Brjánslækur, flight from Akureyri to Reykajavik including taxes, entrance fees and guided excursions as listed. A donation to ASGD will be made on behalf of all travelers. Exclusions: international airfare, passport/visa fees, travel insurance, meals not listed, alcohol, treatments at Blue Lagoon, optional activities, gratuities, and items of personal nature.